In this lyrical work, His Holiness Jigmed Puntsok offers a complete vision of the innate sanctity of life. His poem describes every detail of how one can live in the true heart of purity each moment, with each breath, with every thought. “From My Heart” is His Holiness’ melody of exaltation, celebrating the wonder of eternal liberation. Tulku Orgyen Zangpo Rinpoche will explain the underlying significance of His Holiness’ poem and how it applies to each of us as we remember our true essence as awakened beings. Well, the retreat is over. As with all retreats, you only know afterwards how it was, as you see the ways you seem to have changed. I feel changed, very much. Anam Thubten Rinpoche is a maverick: despite his robes he discourages much ceremony, and goes straight to the teachings of Lord Buddha. He is relentless. He doesn’t stop expounding the teachings, gently hammering home the key point of the Dharma, which is to drop attachment. Anam Thubten Rinpoche is coming to Austin in eight days from now, and this to me is a very big deal, even on a path made up of no big deals. He’ll be here for the retreat weekend of July 28th and 29th, plus the Friday evening on the 27th. 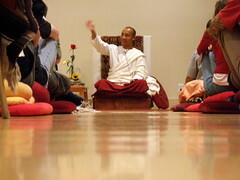 If you’ve never experienced Anam Thubten Rinpoche, well, maybe you should. You can’t help but love the man, his spirit is so warm, and he’s so positive. His particular thing is wakefulness, he wants us to wake up now. He makes it seem possible. Venerable Khenpo Namdrol Rinpoche will be in Austin, Texas July 22 – July 26. This appears to be followed by a teaching on July 25th – more details to follow as they become clear. In 2002 Venerable Khenpo Namdrol Rinpoche founded the Padmasambhava Global Project for World Peace. His biography appears here. Anam Thubten Rinpoche is coming to Austin this month to hold a weekend retreat, on the weekend of July 28-29. This will occur at Clear Spring Studio – 605 Copeland St., Austin, Texas 78704. The weekend costs $125, and the talk on Friday evening, July 27th, is by donation. If you’ve never experienced Anam Thubten Rinpoche you should at least come for the talk on Friday, and if your experience is like mine and others you’ll take away an enduring gift of power. Anam Thubten Rinpoche is a gift giver, and his focus is on awakening now.